> Don Feight > "Meeting of the Strats"
In the late 1940s Boeing developed the C-97 Stratofreighter cargo/transport aircraft from the WWII B-29 bomber. 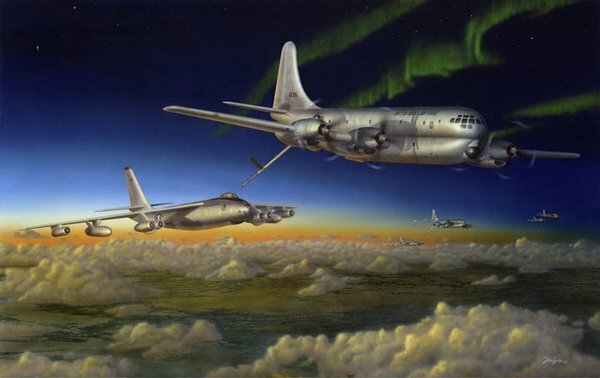 The tanker version (KC-97 Stratotanker) was introduced in 1950 using the "flying boom" refueling system and began the in'flight refeuling of bomber aircraft, usually the Boeing B-47 Stratojet. The performance of the piston-engine aircraft and the faster, high-performance jet bomber was a mismatch from the beginning, so special operational techniques were developed such as refeuling while in a dive. Eventually, the KC-97 was replaced by the much faster KC-135. This image depicts SAC bomber wing aircraft during and evening refeuling operation somewhere near Labrado Canada in the early 1950s.